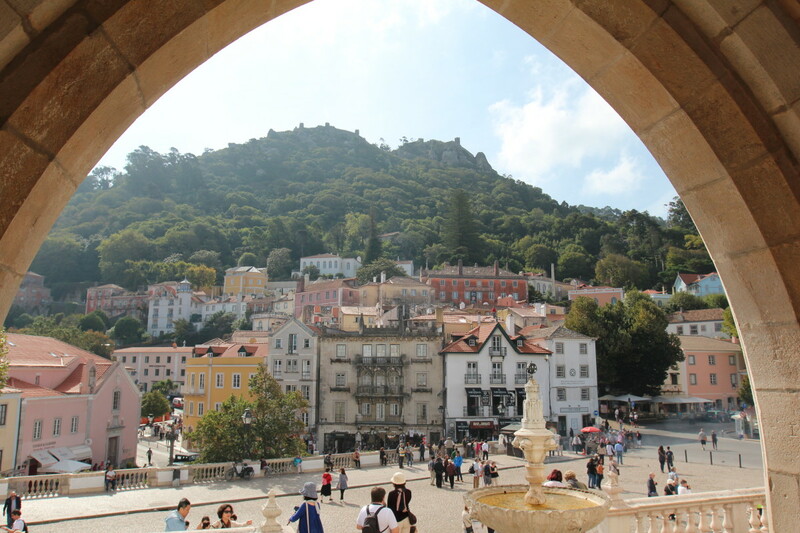 Keen to plan a few day trips from Lisbon whilst visiting the city, we plotted a trip to the beautiful Portuguese town of Sintra. 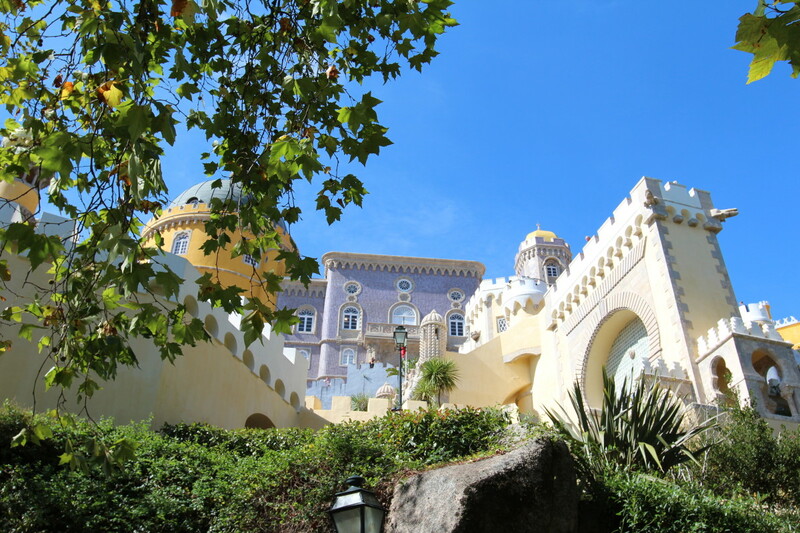 Located just 25km west of Lisbon, Sintra – a UNESCO World Heritage site boasting colourful palaces, extravagant mansions are views out over the Atlantic Ocean – seemed like a no-brainer to visit when we were planning our trip. Below is a full guide on the perfect day trip from Lisbon to Sintra, ending with an ice cream at the sleepy seaside town of Cascais. The journey to Sintra from Lisbon is incredibly easy and one of the reasons why it makes for such a good day trip. We hopped on a train at Rossio Station, which was free thanks to the Lisbon cards we had purchased for our stay in the city. If you don’t have a Lisbon Card, although it comes highly recommended, the train costs under 10 euros. The journey by train takes just forty minutes; a full train timetable can be downloaded here. Situated high up in the mountains, there was a fresher feel to the air as stepped off the train. Lleepy clouds were melting over the palace towers as we took our first glimpses of Sintra. 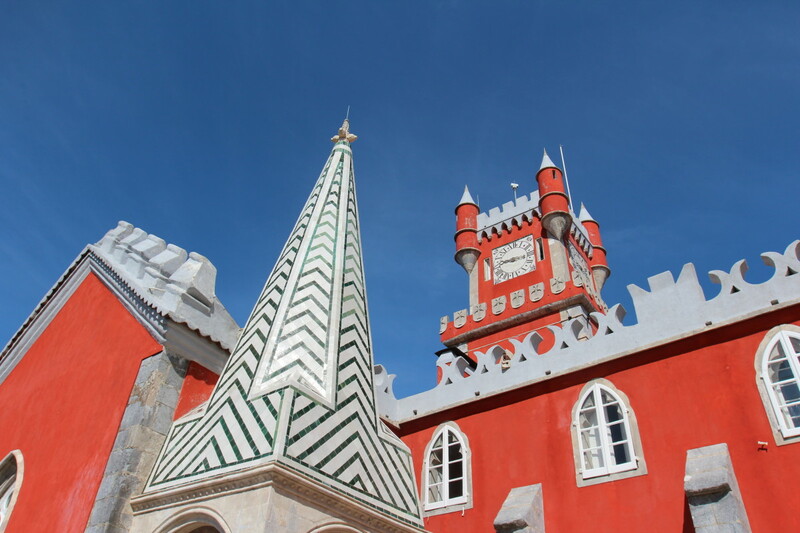 The biggest problem you’ll face when visiting Sintra is just where to start and what to see. There are so many beautiful palaces, gardens – heck even a Moorish Castle – that it is slightly overwhelming and my ‘Fear of Missing Out’ phobia was kicking in. 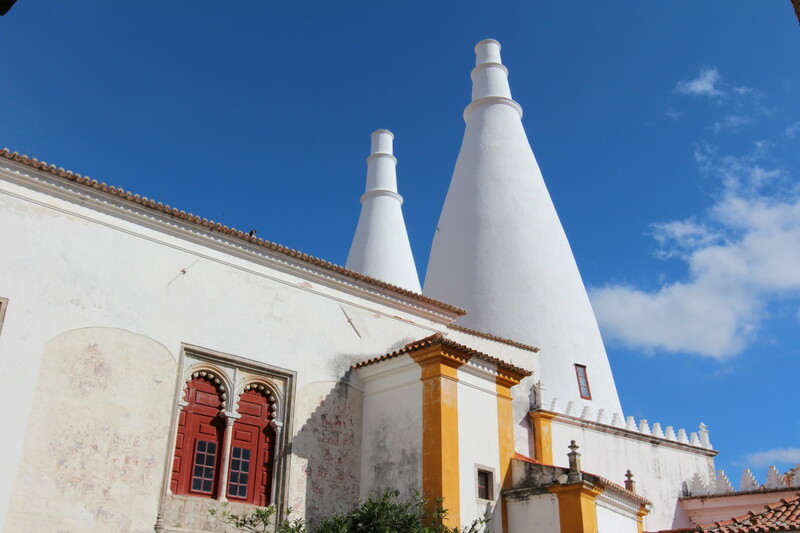 We decided to start with the most centrally located palace, National Palace of Sintra, with its prominent, bulbous chimneys rising up against the blue sky right ahead of us. Compared to other castles and palaces we’ve visited in Europe (I’m talking about you Neuschwanstein), the queue to get into the palace was very quick, although the price was slightly higher than we anticipated. I was intrigued by this palace, mainly for its eccentrically themed rooms. Our walk through the palace took us through a Magpie Room (with magpies decorating the ceiling), a Mermaid Room (with mermaids decorating the ceiling) and a Stag Room (you guessed it, stag horns decorating the ceiling). With its Moorish design, it really reminded me of Seville, so I wasn’t surprised when I learned lots of the tiles adorning the building were imported from the land of flamenco. I set off towards this spot at a fast walk (slight sprint). A quick Google before I left for the trip of Sintra produced the most magical photo of a deep, spiralling well at Regaleria. I needed to see it. 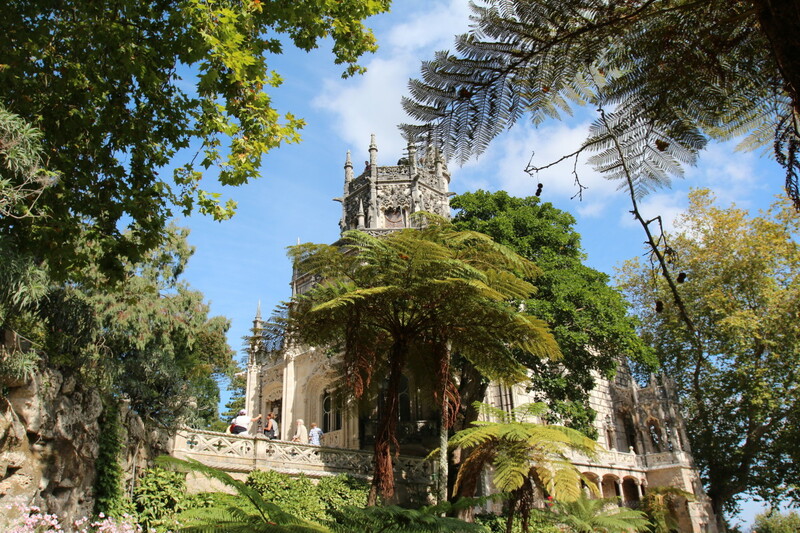 Quinta de Regaleira is, like most of the sights in Sintra, a palace with extensive, mystical gardens of grottoes, wishing wells, turrets, fountains and lakes. It is absolutely beautiful and a place you must visit. You’ll need to give yourself a good couple of hours to explore both the grounds and palace. My favourite part of the gardens were the underground tunnels that delivered you to the bottom of the famous ‘Initiation Well’. This is less a well and more an underground tower, with winding spiral stairs leading up to the daylight. The well was built, it’s said, to perform Tarot initiation rites, adding an even more mystical and magical feel to the place! The grottoes are also a must-see, especially the Waterfall Lake, where you can explore the dark, damp grottoes that lie behind the waterfall. I could have spent a whole day in this garden alone, so bear this in mind when working out your timings! Perhaps the most impressive palace of them all in Sintra, Pena National Palace sits at the top of the hill overlooking Sintra and beyond. The palace lies 3-4km up from the rest of the town, so I do not recommend walking unless you’re on a hike and well-prepared. As we glided past in our taxi, we saw heated arguments between couples, people turning around and walking back down and others looking in a state of despair. Yes, the taxi prices are slightly hiked to get up to Pena, but you’ll be saving yourself a gruelling walk and lots of time. Pena is one of the Seven Wonders of Portugal and is a perfect example of Romanticism design. It was once a Monastery before succumbing to the Great Lisbon Earthquake in 1755 and laid in ruins, before King Ferdinand decided to turn it into the summer residence for the Portugese Royal Family. It is an extravagant palace and after much thought, I concluded that whilst Neuschwanstein would be my winter palace, Pena would have to be my summer palace. What strikes you about the palace is just how many different colours, textures and designs there are, blended into one building. It really is incredible. The palace also has vast gardens that rival Quinta da Regaleira, and again, could probably keep you occupied for most of the day. My favourite part to the palace was its Chapel, which had the most gorgeous glass window that cast multi-colours over the walls and floor. 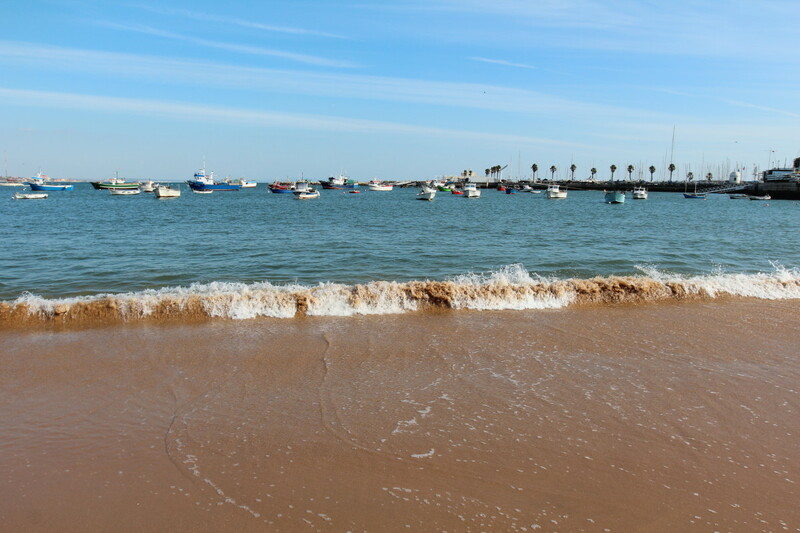 If you’re looking to rest your tired legs after visiting Sintra, hop in a taxi and take the 15-minute journey to Cascais. A seaside town not far from Lisbon. As it was our last night in Portugal, we decided that it would be nice to spend it down by the sea, breathing in the salty air before it was back to the grind in the UK. Cascais is a pretty town and we had a lovely few hours spent lounging on the beach with an ice cream, before ambling our way up to a roof terrace bar for some cocktails looking out to sea. With sand between our toes as we headed back to the train to Lisbon, this was the perfect way to end the week. Obrigado Portugal, you were perfect. "A Guide to a Weekend in Lisbon, Portugal"